My visit to Hakata Tonton was an unexpected surprise on a Monday night (the bf forgot to tell me about the dinner plans). I usually get excited for a meal by reading reviews, looking at pictures, studying the menu, and figuring out exactly what we should order. Although none of this happened, because my one friend has dined here many times, the rest of us trusted him to order, and barely glanced at the menu. 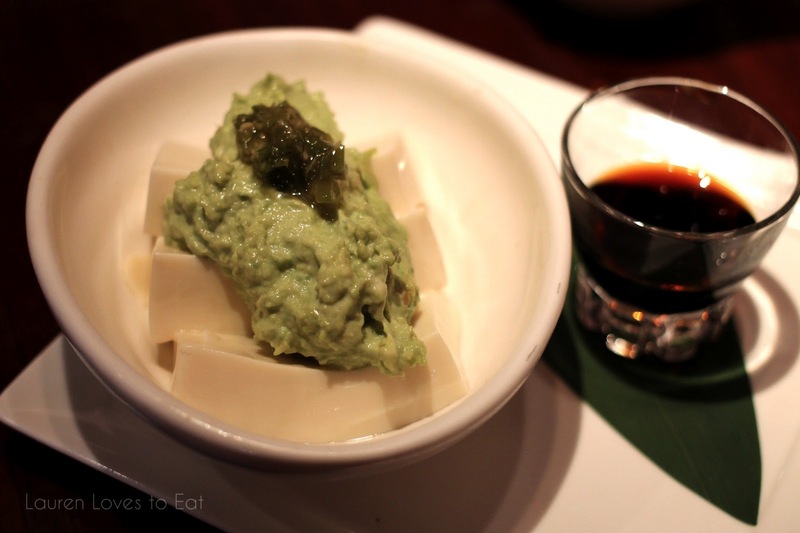 Avocado Tofu, $7: Silky and semi-firm, this unique combination is served with a side of soy sauce. The avocado was sweet and a surprisingly great topping for the wobbly tofu. Foie Gras Inari Sushi, $10: Another beautifully inventive dish. One bite of this and I actually felt giddy. The seared foie gras was out of this world. I'll never be able to eat a plain vegetable topped inari again. The next morning, I texted my friend who arranged this dinner, just to tell him I was craving it already. 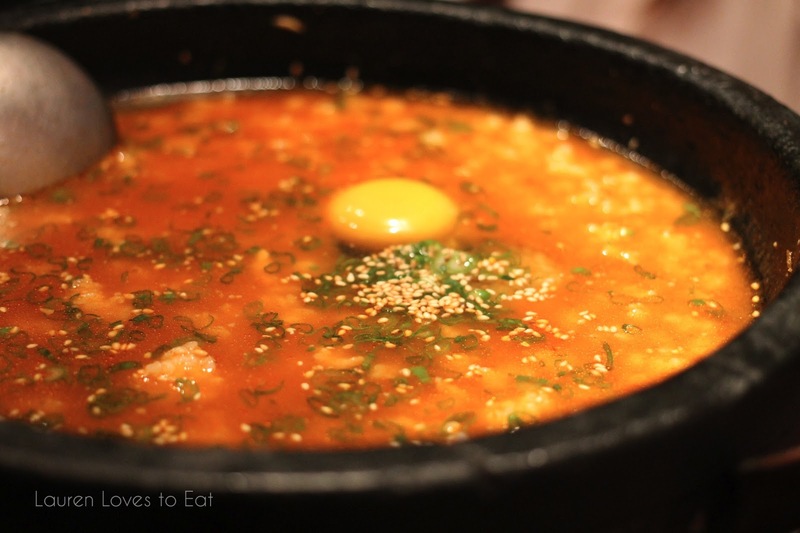 Hakata Tonton Hotpot, $26 ($13 per person, minimum of 2 orders): Since we ordered quite a few dishes, we opted to share two orders between the four of us. It ended up being the perfect amount of food. 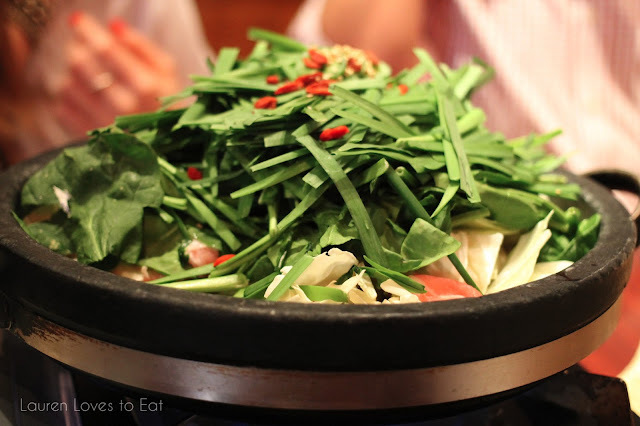 The Tonton hotpot includes collagen broth, tofu, dumplings, vegetables, Berkshire pork belly, and tonsoku. Decent, but I prefer the tastier shabu shabu at Shabu Tatsu. 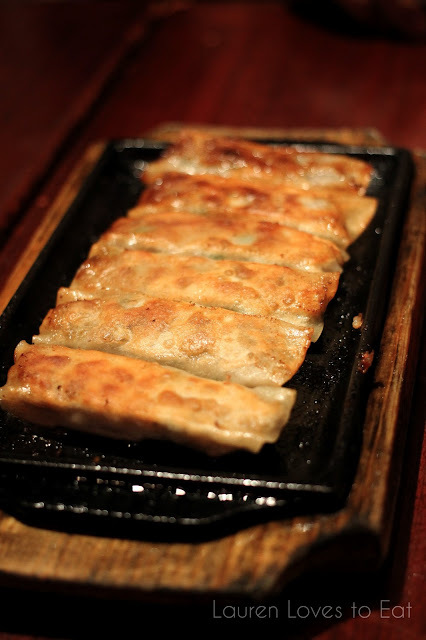 Gyoza, $8: Likely the best gyoza I've had in New York. The skin was thinner than most, resulting in a more ideal ratio of pork filling to skin. I do prefer gyoza to have very dark brown, crispy skin though. My grandma does a great job of this. 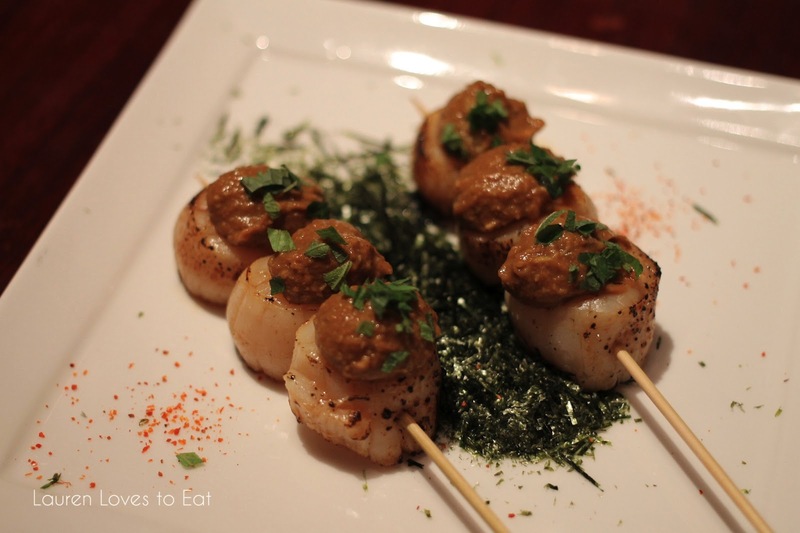 Seared Scallops with Sea Urchin Sauce, $8: The uni had a paste-like texture, and served over the warm and firm scallops, this was another starring dish of the night. We almost didn't order it because we thought we would have too much food. So glad we ended up impulse-buying this. 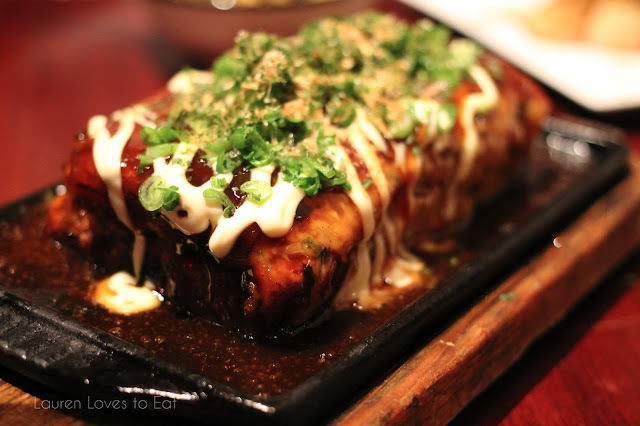 Okonomiyaki with Pork Tonsoku, Konjak, and Okonomi Sauce, $10: This Japanese fried pancake was delightful. It was wonderfully flavorful, doughy filled with chunks of meat and vegetables. 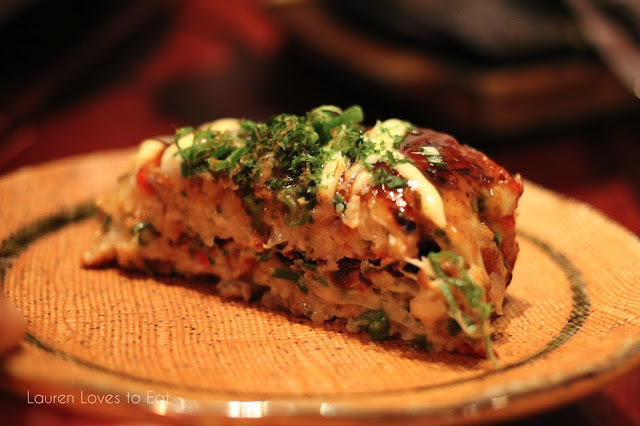 A slice of the okonomiyaki. Rice Bibimbap, $4 (an optional add-on of either rice or ramen noodles cooked in the hot pot soup): Our server forgot about this, so after a few reminders, the rice and egg were brought out. 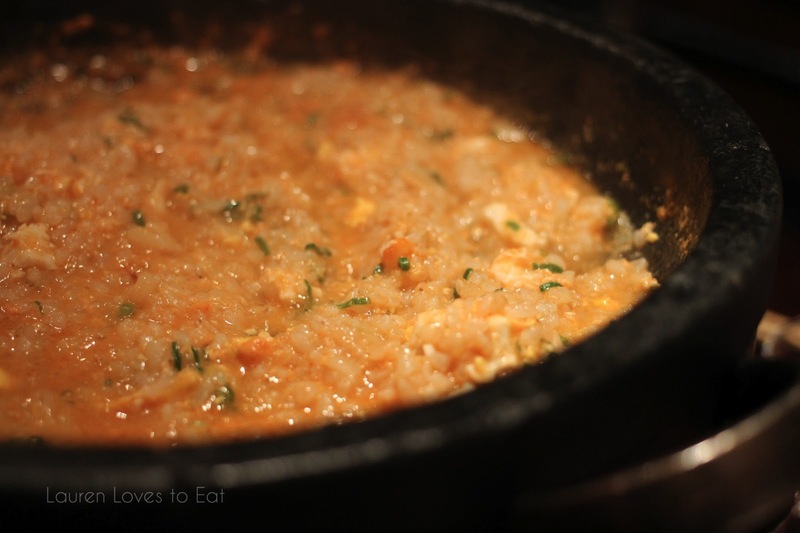 This is usually the best way to end a meal-- warm, flavorful, and soupy. Delicious, but it reminded me of how much I miss Orange Shabu Shabu in Taiwan. Soup slowly being soaked up by the rice. Another great thing about this restaurant is the location! Literally 10 steps away are my favorite dessert shops-- Big Gay Ice Cream, and a few blocks away is Molly's Cupcakes. We stopped at both of course. EVERYthing was delish. 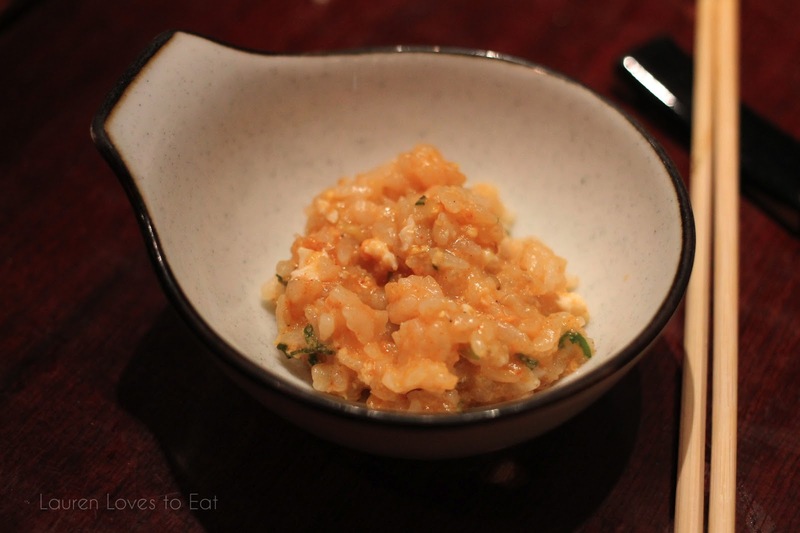 You have no excuse not to go here, esp since you're always in the west village! See you tomorrow! this looks amazing! 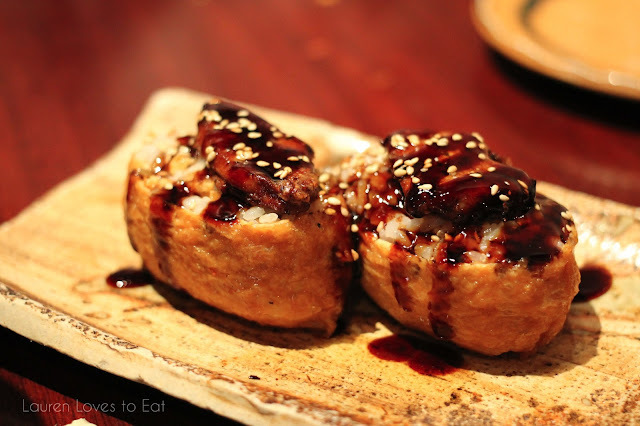 a bit fusion, but who can say no to foie gras topped inari sushi?